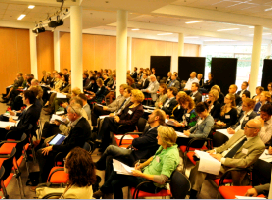 On 16 October 2014, over 130 international and educational policy advisors, directors, students and Dutch and foreign experts gathered in Utrecht for the conference “Making internationalisation work”. The conference kicked off, with an introduction by Elmer Sterken, rector magnificus of the University of Groningen. After valuable contributions of both Anke Buiteveld, of the Dutch Ministry of Education, and Robin Middlehurst, professor of Higher Education at Kingston University London, various interesting topics were presented and discussed during two round of five subsessions. At the end of the day a panel of directors answered questions form the audience and talked about their own institutions’ international ambitions and hopes for the future. This page offers an impression of the conference by a video including interviews with some speakers. Below you can also find several presentations presented during the subsessions and the keynote presentation by Robin Middlehurst, and a written account on the conference and several of the subjects discussed. All input the VSNU will incorporate into the final Report Joint Programmes. The VSNU would like to thank all participants of the conference for their contribution. Here you will find video impression of the conference including interviews. Visit this page to find the presentations used during the subsessions. This page will offer you the digital version of the program. Look here for the keynote presentation of Robin Middlehurst. Read here a review containing a short report on the speeches of both Elmer Sterken and Anke Buiteveld, several subsessions and the panel discussion.